You may feel like the only options for cool posters for your dorm room are scenic views, famous people, and artwork. Maybe you want something a little different for your college dorm room decor. You don't want your college dorm room to look like everyone else's on campus. That's something you probably been thinking about a lot as your put together your college dorm checklist. You want to create a unique hang out place and you've found the perfect dorm essentials for the rest of your college dorm room but need some cool dorm wall art pieces. Look no further than our California Dreamin Dorm Room Poster! This dorm necessities item is pretty cool looking. It will add some unique style to your college dorm room decor and make your college dorm room feel like a relaxing place that you will love to come back to every day after a long day of classes. This dorm necessities item features the flag of California with some unique twists. This dorm decorating item features the bear on a surfboard instead of grass to start with, so if you love surfing this college dorm item just got better! 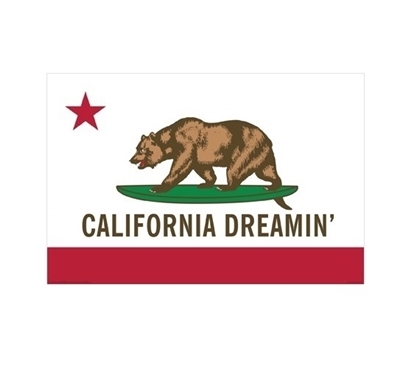 And instead of "California Republic," this cool dorm essentials item has "California Dreamin"! Make your college dorm room decor pop with ultra cool style with unique pieces like our California Dreamin Dorm Poster!